What if your SOMETHING BIG is a party for someone who means a lot to you or does so many kind things for other people…someone you just want to celebrate life with!!?? 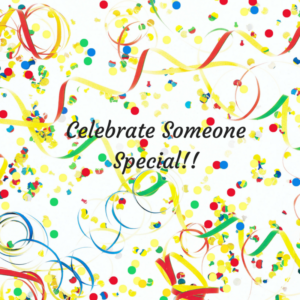 Plan a surprise party for someone who deserves to be celebrated. It takes a little planning but it can be very simple. One year I celebrated my sweet neighbor by having her sisters over to my house for a surprise dinner. She thought she was coming over to have dinner with our family but instead we had her sisters park at the local bank and my husband went and picked them up and brought them to our house. I made a simple meal of baked chicken, mashed potatoes and green beans. Then had a simple dessert. She walked in to her special guests and had the time of her life. I decorated the table pretty and had a copy of Celebrate Life with Jesus book for her and we just enjoyed each other’s company. I loved hearing stories of their lives and the fun times of their childhood. It was one of the best parties I ever planned and it was simple. As we continue to celebrate kindness, think of a way that you can DO SOMETHING BIG to celebrate someone else. Have a great day and let’s go change the world one act of kindness at a time!! This entry was posted on February 17, 2018 with tags: #capturekindness, #kindnessmatters, #makeadifferencetosomeoneeveryday, #rakweek2018 by Deanna Young. Prayer is an act of kindness. Cancer. Addiction. Surgery. Loneliness. Divorce. Children. Parents. Friendships. War. Terrorism. School. Hospital. Jail. Driving. Flying. Fighting. Everyone has something. That’s why all prayers are appreciated. Even if you don’t know the issue, God does. 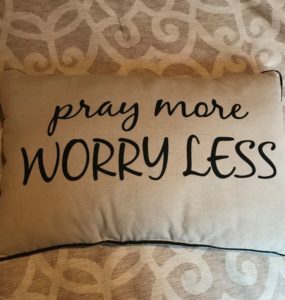 So for an act of kindness today, pray for every person who comes across your path or your mind – just a short prayer that God will grant to peace and a path straight to Him no matter the issue. Prayer is an act of kindness. And we can change the world one act of kindness at a time. This entry was posted on February 16, 2018 with tags: #capturekindness, #makeadifferencetosomeoneeveryday, #rakweek2018 by Deanna Young. The Act of Service is Deeper Than Holding the Door. He held the door for me as I exited the restaurant. I gave the customary “thank you”. But something inside me tugged at my heart to go deeper. “Thank you for your service,” I said to the gentlemen holding the door proudly wearing his Army Vietnam Veteran hat. He was a little taken aback and then shook my hand and humbly replied, “you’re welcome”. It cost no money for me to acknowledge his service. But I believe the gift of a thank you obviously ran deeper than holding the door. It may be awkward to go up to a stranger but I encourage you the next time you see a veteran service man or woman wearing a war-service hat or military fatigue to thank them for protecting our freedom. The appreciation of the thank you far outweighs the awkwardness of the gesture. This entry was posted on February 15, 2018 with tags: #capturekindness, #kindnessmatters, #makeadifferencetosomeoneeveryday, #rakweek2018 by Deanna Young. An idea for today’s Random Act of Kindness is to give a gift basket. Gift baskets do NOT have to be expensive. You can recycle a basket you have at your home or you don’t even have to use a basket. You can use a box, a gift bag, a recycle bag, a bucket, a flower pot, etc. Pinterest® app is filled with hundreds of gift basket ideas. *A baker’s gift basket filled with flour, sugar, brown sugar, baking powder, chocolate chips and a spatula all given in a mixing bowl. *A movie lover’s basket filled with a movie, bags of microwave popcorn, a couple of bottles of soda, and some candy. Add a $10 gift card for pizza if you choose. *A relaxation basket filled with bath bombs ($2 from Target), lotion, candle and some chocolate. *A golf basket filled with golf balls, a golf towel, some golf tees and some snacks. *A dog lover’s basket filled with a leash, some dog treats, a toy and some “picker upper” bags. *A tool man’s basket filled with screw drivers, measuring tape, hammer, and some snacks. *For the pasta lover – a box filled with a favorite kind of pasta, spaghetti or alfredo sauce in a jar, parmesan cheese, a collapsible colander and a cookie mix. You can make it as big or as small as you wish. Just an idea for a kindness act to make a difference to someone today. Have a great day as we change our world, one act of kindness at a time! 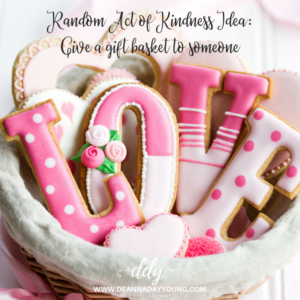 This entry was posted on February 14, 2018 with tags: #capturekindness, #kindnessmatters, #makeadifferencetosomeoneeveryday, #rakweek2018 by Deanna Young. Random Act of Kindness to Co-Workers. Whatever the treat, spread kindness to your co-workers as you celebrate Mardi Gras Fat Tuesday! 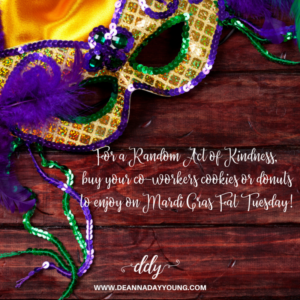 This entry was posted on February 13, 2018 with tags: #capturekindness, #fattuesday, #kindnessmatters, #makeadifferenceeveryday, #mardigras, #rakweek2018 by Deanna Young. Let the Kindness Begin….And Continue!! It’s Random Acts of Kindness Week. What a great way to continue our Make A Difference Month! For other suggestions, you can see my previous blogs that started February 1. Today’s idea is to donate to or volunteer at your local humane society or animal shelter. It’s amazing how one small act can make such a big difference. Most animal shelters take dog and cat food, toys, paper towels, cleaning supplies, collars and kitty litter. Call them and see what they need most. Colossians 3:12 – Therefore, as God’s chosen people, holy and dearly loved, clothe yourself with compassion, kindness, humility, gentleness and patience. Have a great Make A Difference Monday and let’s go change the world one act of kindness at a time! 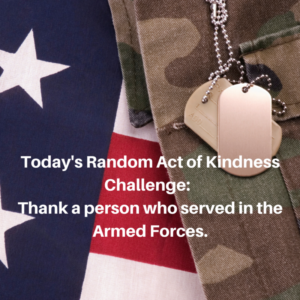 This entry was posted on February 12, 2018 with tags: #capturekindness, #makeadifferencemonday, #rakweek2018, #randomact by Deanna Young. I love sharing my experiences through scripture and humorous stories to encourage women. I have been speaking since 2000 to women’s groups at state conferences, mother-daughter banquets, civic organizations, churches, etc. This module is used in order to add a border directly under the Public Speaking widget in the sidebar. The content (title/this text) is hidden but the border is displayed. Necessary to allow custom background in the Public Speaking widget above. Grab My Hand. The Wind is Strong. Welcome to “I’ve Got This” Radio. Easter Egg Hunt of a Different Kind. Deanna Young on Grab My Hand. The Wind is Strong. Laurie on Grab My Hand. The Wind is Strong.